Below is a sampling of updates from the Fall 2016 East Asian Languages and Literatures Newsletter. To see the full newsletter, click on the thumbnail to the right. This is my third year as chair of the department. I am truly excited about various developments in the department. In April, we organized a one-day interdisciplinary symposium exploring how the language systems and art forms of East Asia reflect multiple and intertwined paths of cultural flow. In August, our new MA program in Chinese started and we welcomed brand new students, some of whom are serving as graduate assistants. This coming October, the Kim-Renaud East Asian Humanities Lecture Series will kick off, funded by Professor Emeritus Young-Key Kim-Renaud and Dr. Bertrand Renaud’s generous donation. In November, we will host a national Japanese speech competition. Our ambition as an academic, educational and entrepreneurial entity is being supported and showcased in many ways. I hope that you will keep watching us grow. The Master of Arts degree in Chinese Language and Culture was launched in August this year. This is the only humanities-oriented master’s program in the mid-Atlantic region. 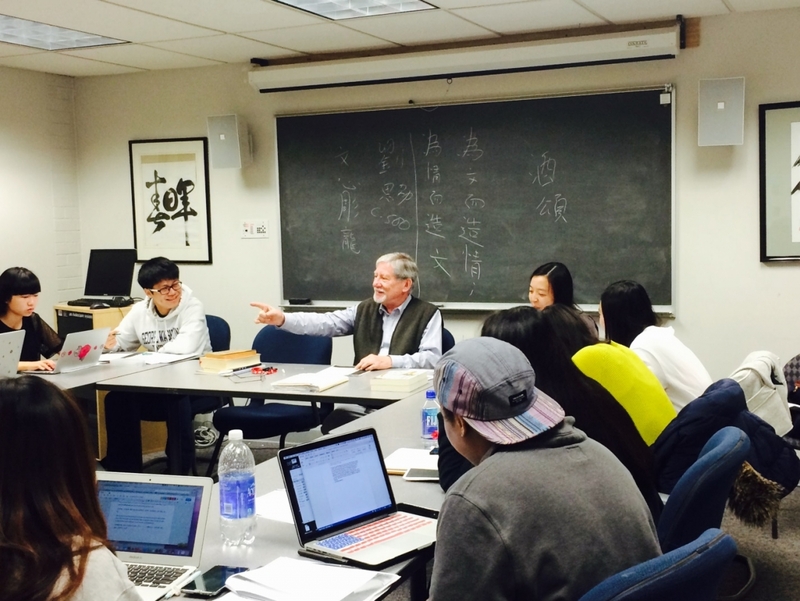 It offers students the opportunity to deepen intellectual, cultural and linguistic understanding of China. Being in the heart of the nation’s capital, our program allows students the opportunity to enrich their experience by interacting with all kinds of leading institutions. We wish our students and professors success! On the heels of the success of last year’s regional Japanese speech competition, J-LIVE (Japanese Learning Inspired Vision and Engagement) 2015, the Japanese program presented this year’s J-LIVE Talk 2016. This is a college-level Japanese language speech competition that emphasizes a comprehensive range of learned communication skills. The competition consisted of a preliminary round (September 1-October 13) during which entrants sent in a short video on a designated topic, followed by a final round of live presentations of their choice held at Marvin Center Amphitheater on November 13, 2016. The top awards include a chance to study abroad in Japan, as well as cash prizes. While last year’s event was jointly organized by the Language Center and the Japanese program, this year the Japanese program is going solo. Last year, entrants came from the mid-Atlantic region; entrants this year will come from much wider areas of the United States. The Japanese professors, led by Executive Director Professor Takae Tsujioka, are really excited. The event is being funded by grants and gifts from private and public foundations and businesses. 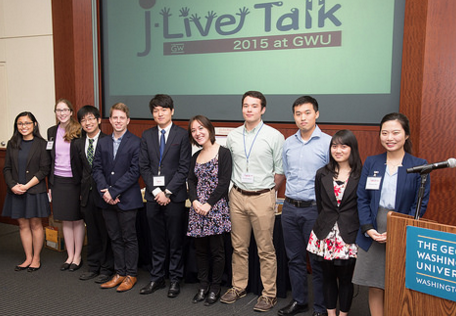 Photo: Finalists at the 2015 J-LIVE —Japanese Learning Inspired Vision and Engagement. Jonathan Chaves is a major contributor to the newly published exhibition catalogue-book, 17th Century Chinese Paintings from the Tsao Family Collection, ed. Stephen Little, Munich, London, New York: DelMonico Books/Prestel and The Los Angeles County Museum of Art, 2016. Read more here. Liana Chen was invited to give a talk on “Power into Play: Theater and Qing Court Culture” at GW Textile Museum’s 2016 Fall Symposium on “Picturing China: Qing-Dynasty Photography and Fashion.” Professor Chen also served as a consultant for the United States Postal Service’s Celebrating Lunar New Year series: Year of the Monkey stamp for 2016 project. She will also be serving as an executive committee member for the Modern Language Association Ming and Qing Forum. Shoko Hamano spent the summer of 2016 writing three articles for publication on Japanese sound symbolism. In December, Professor Hamano will deliver an invited speech at the NINJAL (National Institute for Japanese Language and Linguistics) International Symposium 2016 in Tokyo. Read more here. Leo Hanami presented a paper entitled “Gateway to authentic literary text: Short stories by Murakami Haruki” at the Foreign Language Association of Virginia 2016 Annual Conference with Professor Kumi Sato of Georgetown University and his colleague, Professor Takae Tsujioka. Takae Tsujioka was invited to speak at National Japan Bowl about J.LIVE Talk 2016 (see story above) for which she serves as executive director,. She was also one of the invited representatives from Mid-Atlantic Association of Teachers of Japanese at the Articulation Leadership Workshop held at Old Dominion University as part of the Japanese Core Practices Articulation/Advocacy Network organized by American Association of Teachers of Japanese. Miaochun Wei received a best teaching activity award at the Second International Symposium of Chinese Language Teacher Association and a dissertation research award from the National Federation of Modern Language Teachers’ Association in April 2016. For more information, please see page 54 of the conference program. Anri Yasuda presented a paper about the author Dazai Osamu and his literary expressions of gender at the 2016 Japan Studies Association Conference. Her paper entitled “Endeavors of Representation: Writing and Painting in Akutagawa Ryûnosuke’s Literary Aesthetics” is forthcoming in the Journal of Japanese Language and Literature. Recipient of a Japan Foundation Research Fellowship, Professor Yasuda will be doing research in Tokyo in spring 2017. Phyllis Zhang worked on her new textbook for intermediate Chinese, JIAOLIU, during her sabbatical. This textbook is currently being produced by Cengage Learning. Building on her successful beginner’s program (Ni Wo Ta, Cengage Learning 2015), Professor Zhang incorporated into this textbook a video-driven design with enhanced listening-speaking training. The storyline video was filmed in China. This intermediate course is an integral part of Professor Zhang’s technology-enhanced and proficiency-oriented textbook series titled Developing Chinese Fluency. Tiffany Dennis, BA ’16, is living in Seattle while serving as a second lieutenant in the U.S. Army. Tyler Dimicco, BA ’11, is a product manager for Kindle China at Amazon. Zack Ferguson-Steger, BA ’02, is close to finishing a 3+ year expat assignment with a Japanese trading company in Tokyo. Marriage came the last year! Avonda Fogan, BA ’16, is currently working at US-China Strong in Washington, D.C., as the special assistant to the CEO. Todd Morrill, BA ’14, is currently working at PwC as a management consultant. He has pivoted into working in data science in the past year with a focus on machine learning. Working in Shanghai, China, is still a top priority for him within the next 12-18 months. Clark Munson, BA ’03, took a six-week vacation to Japan this summer with his wife after she graduated B-school! His 5-year-old daughter attended preschool and, by the end, could interrupt his conversations with adults to tell them when he was wrong. Todd Platek, BA ’70, has been practicing civil, maritime, corporate and immigration law in New York since 1986. His clients are all Chinese from Mainland and Taiwan. He uses spoken Mandarin and written Chinese daily in his work. Emma Schwoerer, BS ’16, was accepted to Nanzan University's Summer Intensive Language Program and spent two months in Nagoya working on her Japanese. She is now back in the United States and about to start a data analyst job at Indeed.com. Vanessa Tenazas, BA ’15, after GW, moved to Suzuka City in Japan to be an assistant language teacher (ALT) with the JET program. She is now entering her second year as an ALT, and in her free time she has taken up classes in Naginata and voice acting. She is looking forward to more adventures! She just wrapped up nearly five years at the Public Defender Service in D.C. She received a Fulbright grant and is moving to London in September to work on PhD research on forensic DNA. Hannah Zerphey, BA ’05, this summer, graduated with a 300-hour yoga teacher certificate and in 2019, she will graduate as a certified yoga therapist. Her web/graphic design business, wise panda designs, continues to thrive and recently has taken off in a new direction!